are produced with industrial breeding lines. I was inspired to create this series by former Beatle and vegetarian advocate Paul McCartney(Macca) who partnered with the Meatless Monday campaign to promote less consumption of meat. We not only discuss the many advantages of a less meat diet we also do some cooking, share recipes and listen to great Beatle/McCartney music! I thought I could resist after all I’m not a royalist. But, I raised myself on English literature. As a pre-teen the minute I got home from school I would grab whatever Dickens or Austen I was reading at the time, fix myself some real English tea, with milk of course and settle in for a couple of hours. I would enter the nineteenth century English world of poor children living in debtors prisons with their families, spinsters locked into Victorian morals and always present in the background the pure romantic fantasy of The Royals. Kings and Queens and Princes and especially Princesses whose dresses I would try to imagine. I credit Dickens with my politics and my first interest in cooking was because I wanted to have scones with my tea. So how can I dismiss a real Royal Wedding? To really enjoy the wedding I have to whitewash my knowledge of the history and concentrate on the fantasy. I can do that. So today I’m heading to London for my interpretation of the Royal Wedding, sans crowds and with a vegetarian twist to the Wedding Breakfast. We’ll have to wait until Saturday to see the ceremony but nothing can stop us from enjoying some veggie Wedding Breakfast treats beforehand. 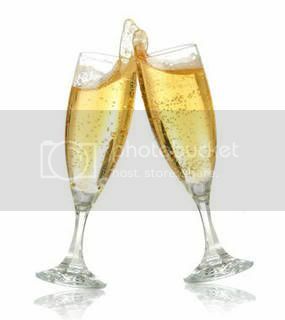 I don’t know what champagne will be served but I’m sure it will be plentiful. Of course, at this point I don’t know the menu to be served but there is much speculation that it will be a menu of traditional favorites interspersed with some elegant selections showcasing London’s new status as a culinary destination. Heat large nonstick griddle or skillet over medium heat; brush with butter. Drop batter by 1/3 cupfuls onto griddle. Cook pancakes until brown, brushing griddle with more butter as needed, about 3 minutes per side. Transfer to sheet in oven to keep warm. English pancakes are different from American pancakes. They are much thinner and contain no leavening. They are closer to a French Crepe, only slightly thicker. Traditionally they are served on Shrove Tuesday but are enjoyed year round. In a large mixing bowl, whisk together the flour, sugar, and salt. Add the egg and egg yolks, followed by the milk and 1 tablespoon of the vegetable oil. Continue whisking until there are no lumps.. In a separate small saucepan, melt the butter until it is golden brown, and whisk it into the pancake mix. Leave the batter to rest for about 15 minutes. 2. Heat an 8-inch frying pan until hot, and add the remaining 1 tablespoon vegetable oil, tilting the pan to spread the oil across the bottom. When the oil starts to smoke, pour the excess into a small bowl for later use. Return the pan to the heat. You now have a sheer coating of oil remaining on the pan. 3. Pour 2 tablespoons of the batter into the pancake pan, tilting the pan to coat the bottom evenly. Cook until the underside of the pancake is golden brown, and then, using a spatula turn it over and cook the other side. Turn the pancake out onto an upturned dinner plate. Repeat until there is no more batter, using a bit of the reserved oil if the pan appears to be dry, or if the pancakes begin to stick. 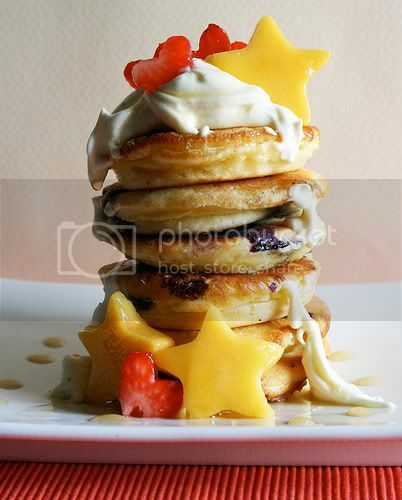 Continue to stack pancakes on top of each other on your dinner plate. When finished, served the pancakes straightaway with the sugar for sprinkling . Serve the lemon and orange wedges on the side for squeezing. If you want to make the pancakes in advance, lightly butter an ovenproof tray, and sprinkle each pancake with sugar after you finish cooking it. Fold the pancakes in half and then half again, arranging them all neatly on the tray. Cover the tray with foil and bake at 350 degrees for about 15 minutes. 1. Preheat oven to 350 degrees, with rack in lowest position. In a large skillet, melt butter over medium. Add leek and asparagus; season with salt and pepper. Cook, stirring occasionally, until asparagus is crisp-tender. Cook whole asparagus until tender, 6 to 8 minutes; let cool. 2. In a large bowl, whisk together eggs, half-and-half, 1/2 teaspoon salt, teaspoon pepper, and a pinch of nutmeg. Place pie crust on a rimmed baking sheet. Sprinkle with cheese; top with asparagus mixture. Pour egg mixture on top and decorate with whole asparagus if using. To make sure the vegetables are distributed evenly, spread them in the crust before pouring in the egg mixture. 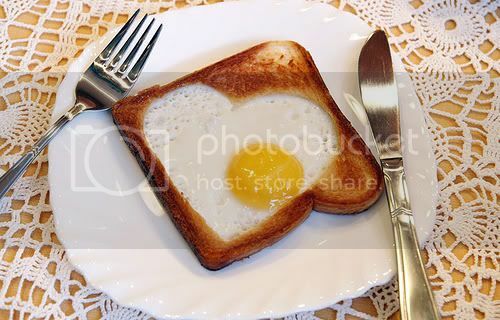 Use heart cookie cutter to cut heart out of one slice of bread. Fry bread in butter, turn over and break egg into heart opening. Fry to desired firmness. Salt & pepper. Preheat the oven to 400°F. Grease a baking sheet. Add the butter. Using a pastry blender or your fingers, rub it into the dry ingredients until mixture resembles a coarse meal. Stir in the milk until a very soft dough is formed. Do not overwork. Drop the dough in 6 equal portions onto the prepared baking sheet. Lightly pat the dough into rounds—3 to 3 1/2 inches in diameter—and lightly brush the tops with the cream. Bake the shortcakes in the center of the oven for 15 to 20 minutes or until golden brown. Cool on a wire rack. Place strawberries in a bowl. Sprinkle with lemon juice and sugar, then gently toss with a rubber spatula. Let rest for 1 1/2 to 2 hours for juices to develop. Just before serving, whip cream with 1 Tbsp sugar until it holds soft peaks. To serve, slice off the top third of each shortcake. Place the bottoms on 6 dessert plates and top with 1/3 cup of the prepared berries and juice, plus a spoonful of whipped cream. Cover with the top. Spoon over more berries and juice, then dollop with whipped cream. Garnish each with a whole berry and drizzle with any remaining juice. Preheat the oven to 180oC/ 350oF/ gas mark 4. Slice the brioche loaf and then cut into triangles. Layer the slices into a 8 inch square Pyrex Cake Pan. Beat together the eggs, milk and sugar. Pour half the egg mixture over the brioche, allow approximately 5 minutes for the brioche to absorb the mixture before adding the remaining liquid. Arrange the blackberries over the soaked brioche and bake in the oven for 15 minutes. 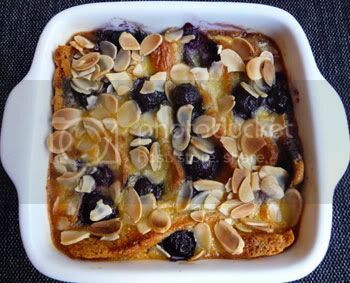 Sprinkle the almonds over the bread and butter pudding and cook for a further 10 minutes. Serve hot with fresh cream if desired. Steep 1 heaping teaspoon of the lavender Earl Grey tea leaves in 1/4 cup boiling-hot water for 3 minutes. Strain, and reserve the tea. 3. In a coffee or spice grinder, grind the remaining teaspoon of lavender Earl Grey tea leaves to a very fine powder. Place the powder in a large mixing bowl, and add the flour, sugar, baking soda, baking powder, and salt. Stir until combined. 4. With clean hands, work the butter into the dry mixture until it is thoroughly incorporated and has the consistency of fine breadcrumbs. 5. Make a well in the center of the dry ingredients, and pour the buttermilk, vanilla extract, and 1 tablespoon of the brewed lavender Earl Grey tea into the well. Combine the ingredients until all the dry mix is wet, but do not knead! 6. Turn the mixture onto a floured surface and gather the dough together. Gently pat the dough to make a rectangle about 1 1/2 inches thick. 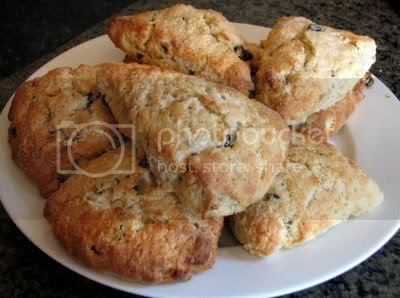 Using a dough cutter, cut the scones into wedges measuring about 3 1/2 x 4 inches, and lay them on a nonstick baking sheet. Gather the remaining dough together lightly to cut out more scones—just don’t knead the dough too much. Let’s talk about the Wedding Cake. I understand that the primary cake will be the traditional English Fruit Cake. There is wild speculation that the groom’s cake with be William’s and his Grandmother’s (The Queen) favorite which is Chocolate Biscuit Cake. I make a cake which I totally love which is similar. 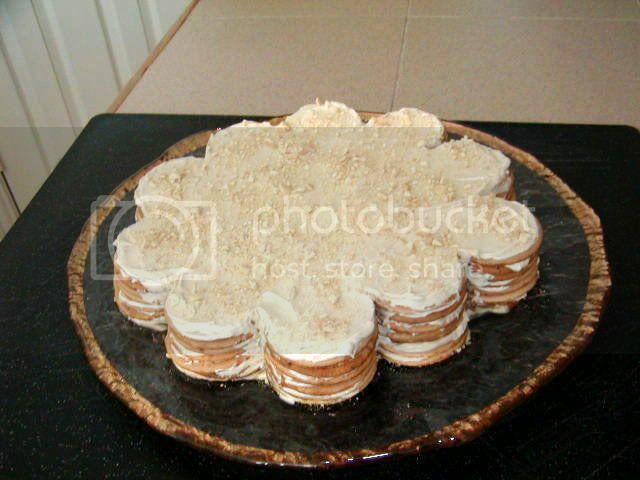 The beauty of the biscuit cake is that it’s a no bake cake. Just assemble and chill…easy enough for a child to make..gotta love that William! I’ll show you my recipe first and then the recipe for the Royal’s favorite which comes from a chef who worked at the palace and verifies that it is the Queen’s favorite. 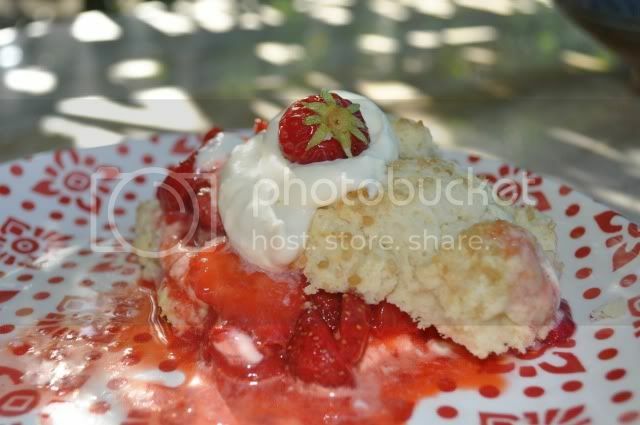 * Whip cream into soft peaks then whip with mascarpone, 1 tsp lemon juice and sugar until firm. * Add coffee to 500 ml boiling water. * Dip a tea biscuit into coffee for 1 second and shake excess coffee before placing on servicing plate. * Repeat until forming the shape desired with 1 layer of biscuits. * Lightly spread mascarpone cream over biscuit layer. * Repeat the process with 8 layers building towers. * Cover the towers with whipped mascarpone cream. * Add 1 layer of lemon curd on top of the cake. * Decorate as desired and put in the fridge for at least 2 hours before serving. 2. Melt the 4 ounces of dark chocolate in a double boiler. Add the butter and sugar mixture to the chocolate, stirring constantly. Add the egg and continue stirring. Fold in the biscuit pieces until they are all coated with the chocolate mixture. 3. Spoon the chocolate biscuit mixture into the prepared cake ring. Try to fill all of the gaps on the bottom of the ring, because this will be the top when it is unmolded. Chill the cake in the refrigerator for at least three hours. 4. Remove the cake from the refrigerator, and let it stand while you melt the 8 ounces of dark chocolate for icing. Slide the ring off the cake and turn the cake upside down onto a cooling rack. Pour 8 ounces of melted dark chocolate over the cake, and smooth the tope and sides using a butter knife or offset spatula. Allow the chocolate icing to set at room temperature. Carefully run a knife around the bottom of the cake where it has stuck to the cooling rack, and transfer the cake to a cake dish. Melt the white chocolate and drizzle on top of the cake in a decorative pattern.